Ryan Kalil (born March 29, 1985) is an American football center for the Carolina Panthers of the National Football League (NFL). He played college football at USC, where he was a member of two national championship teams, was named a first-team All-American, and won the 2006 Morris Trophy. He was drafted by the Panthers in the second round of the 2007 NFL Draft. Kalil has been selected to the Pro Bowl in 2009, 2010, 2011, 2013, and 2015. Kalil went to Servite High School in Anaheim, California, where he was teammates with New England Patriots wide receiver Matthew Slater. Kalil attended the University of Southern California, where he played for the USC Trojans football team. He was a 2005 Sports Illustrated All-American, and won the USC Trojans' Bob Chandler Award in 2005 and Courage Award in 2004 and on the watch list for the Lombardi Award. Kalil was on the official watch list for the Rimington Trophy for the top college football center and the Outland Trophy watch list for the best lineman. He was named to the 2005 and 2006 Pac-10 coaches and Rivals.com All-Pac-10 team First Team. He was a Pro Football Weekly All-American choice and a Rivals.com second-team All American and SI.com honorable mention All-American. Kalil was voted "lineman of the year" by his Trojans teammates and won the 2006 Morris Trophy. Kalil was invited to play in the Senior Bowl prior to the 2007 NFL Draft. He ran the 40 yard dash in 4.94 seconds at the 2007 NFL Combine and bench pressed 225 pounds 34 times. His performances at the combine and the Senior Bowl impressed scouts and led many analysts to project he would be selected in the first or second round of the 2007 NFL Draft. Kalil in his rookie year playing for the Panthers. Pre-draft predictions turned out to be correct, as Kalil was selected in the second round of the draft with the 59th pick by the Carolina Panthers. He was the first center to be selected in the 2007 draft and joined his teammate from the USC Trojans, Dwayne Jarrett, who the Panthers also selected in the 2nd round. In 2007, Kalil started 3 games. In 2008 Kalil was named the full-time starter at Center. He started in all 12 games that he appeared, missing 4 due to injury. In 2009, Kalil was voted second-alternate to the 2010 Pro Bowl. He later was given a spot due to an injury by the first alternate. 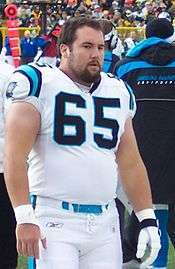 In 2010, Kalil was named a first alternate, but was added to the roster after Giants center Shaun O'Hara pulled out. In 2011, Kalil received a franchise tag from the Carolina Panthers. On August 19, 2011, the Carolina Panthers signed Kalil to a 6-year $49 million deal, making him the highest paid center in NFL history. He was selected to the Pro Bowl as the starting center of the NFC team. It was announced on December 23, 2015 that Kalil was one of ten players on the Carolina Panthers voted into the 2016 Pro Bowl, making it Kalil's fifth appearance. Kahil could not play in the Pro Bowl due to the Panthers appearance in Super Bowl 50. For the 2015 season, PFF rated Kalil as the third-best run-blocking center in the NFL. On June 6, 2016, Kalil signed a 2-year extension with the Panthers. Kalil had been dealing with a shoulder injury for several weeks before leaving the Week 11 game against the New Orleans Saints. He was placed on injured reserve on November 29, 2016, ending his season. Kalil's father Frank played football for the University of Arkansas and the University of Arizona. He was drafted by the National Football League Buffalo Bills in 1982 and later played in the United States Football League until 1984. His mother, Cheryl (née Van Cleave), was Miss California in 1981. He is of Lebanese and Mexican heritage, and has two siblings: brother Matt, is a former starting offensive tackle at USC, and was drafted 4th overall by the Minnesota Vikings in 2012. Their sister Danielle sang the national anthem at the Vikings–Panthers game, which featured both her brothers, on October 13, 2013. Kalil and his wife Natalie, a former USC cheerleader, have two daughters. Kalil has interests in the film industry, having made claymation films as a child and worked with fellow USC-alumnus Will Ferrell on a football training spoof for the NFL Network. In June 2016, Deadline.com announced Kalil will serve as an executive producer along with Dwayne Johnson producing Sony Pictures film "Son of Shaolin." Kalil financed production of the underlying graphic novel through his Strange Turn Entertainment banner. ↑ . 2006 All-Pac-10 team, scout.com, November 27, 2006. ↑ USC's Kalil is making his move, Los Angeles Times, April 27, 2007. ↑ Dator, James (2011-02-22). "Panthers placing franchise tag on C Ryan Kalil". Cat Scratch Reader. Retrieved 2016-06-08. ↑ Mortensen, Chris (August 20, 2011). "Sources: Panthers lock up Ryan Kalil". ESPN.com. Retrieved January 18, 2016. ↑ "Panthers have NFL-best 10 players selected for Pro Bowl". USAToday.com. December 23, 2015. Retrieved January 18, 2016. ↑ "10 big-name NFL players that missed PFF's Top 101". www.profootballfocus.com. Retrieved 2016-06-08. ↑ Triplett, Mike (2016-06-06). "Panthers sign Pro Bowl center Kalil to extension". ESPN.com. Retrieved 2016-06-08. ↑ Henson, Max (November 29, 2016). "Ryan Kalil, Gino Gradkowski placed on IR". Panthers.com. 1 2 "Working the room". Los Angeles Times. April 27, 2007. ↑ "Kalil brothers face each other for first time". Star Tribune. October 12, 2013. 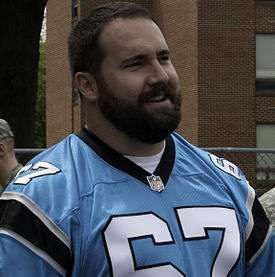 ↑ "Carolina Panther Ryan Kalil reflects on being a dad". WCNC-TV. June 14, 2016. ↑ "Ryan Kalil Adding Executive Producer to His Growing Résumé". 2016-06-23. Retrieved 2016-07-09. ↑ Jr, Mike Fleming (2016-06-22). "Dwayne Johnson Sets Jay Longino Graphic Novel 'Son Of Shaolin' At Sony". Retrieved 2016-07-08.